Using mnemonics as a memory tool is an ancient tradition. A mnemonic is by definition a memory aid. There are many different types, all derived from principles and techniques used to organize impressions in order to improve recall. Making associations or connections is how we remember things. All learning requires associations and connections – even rote memorization may involve making an association. It could be remembering the picture of a word or the shape of a number on a flash card. Using mnemonics is an effective way of creating new connections in the brain. One common mnemonic type is using the first letter of a list of items to create an acronym that is easy to remember. An example you might be familiar with is Roy G. Biv. The acronym is used to remember the colors of a rainbow or those created by a prism, as well as the order in which they appear. R is for red, O for orange, Y for yellow, G for green, B for blue, I for indigo and V for violet. You might have a question about why using mnemonics as a memory tool works. Why is it easier to remember the name Roy G Biv than it is to remember the list of seven colors? The easiest way to explain it is that the brain can only hold so many items in working memory. By creating two names and a single letter initial out of seven colors, you have reduced the number of items that the brain must hold in working memory from seven to three. You have actually reduced the number of things that the brain needs to remember. 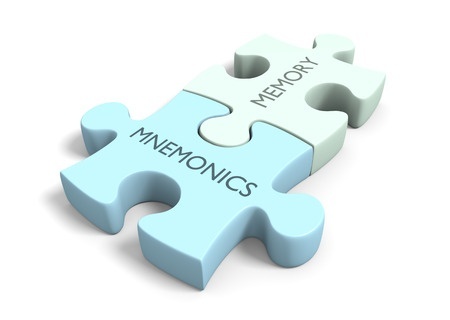 Using mnemonics allows more information to be stored in a smaller space.